I had the good fortune of receiving this magic (...and I guess no longer secret) ingredient from a colleague at work today and couldn't wait to put it good use. 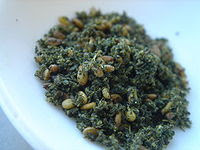 To my surprise, zaatar resembles very much a beloved spice from my childhood in Bulgaria called samardala ( [самардала] in Bulgarian ) - an herb with garlicky flavor called honey garlic (Nectaroscordum siculum ssp. bulgaricum syn. Allium bulgaricum). It turns out Zaatar contains savory - another Bulgarian staple. Za'atar (Arabic: زعتر‎, also romanized zaatar, za'tar, zatar, zatr, zahatar, zaktar or satar) related Middle Eastern herbs from the genera Origanum (Oregano),Calamintha (Basil thyme), Thymus vulgaris (Thyme ) and Satureja (Savory). It is also the name for acondiment made from the dried herb(s), mixed together with sesame seeds, and often salt, as well as other spices. Used in Arab cuisine since medieval times, both the herb and spice mixture are popular throughout the Middle East and Levant. Interesting dressing! As always I am looking for new dressings. Marulka, could you, please, ask you colleague where she bought the spice. Was it the International Food Bazaar? I bought the tahini from Whole Foods and the spice is from International food bazaar. Ich habe diese Uhr für meinen Vater am Vatertag auf dieser Website gekauft. billiger rolex UhrenDiese Uhr wurde gekauft, seit mein Vater sie getragen hat, sie lief und arbeitete sehr hart.besten rolex cellini UhrenSie sieht so aus, dass sie sich nicht von echt unterscheidet und das Design perfekt ist.